Please welcome J. Kent Messum to the blog! He kindly answered a few of my questions about his new book, Husk, and much more! Will you give us the scoop on Husk? What inspired you to write it? Husk is my second novel with Penguin Books. It’s a piece of speculative fiction that takes place in a near future where life is bleak and technology has conquered death. However, this new ‘immortality’ is reserved only for the ultra-rich and the ‘afterlife’ (uploading consciousness onto computer servers) proves to be unfulfilling. The digitized dead yearn only to live again naturally, but cannot. So they do the next best thing: rent a ‘Husk’. A husk is someone, usually a perfect human specimen, who rents out their body and brain to billionaires, allowing these clients to pilot them around for up to three days while the Husk’s consciousness goes into a dormant state. The novel follows the main character, Rhodes, as he starts to suspect that one of his clients is using him for questionable purposes during their sessions. He begins to investigate his whereabouts while on the job, and is soon dragged into some truly frightening territory. Inspiration for Husk came from our collective human fear of death and fascination with immortality. The Western world has entered an era where science and technology are looking to overcome the biological limitations of life. What was once regarded as fantasy is now looked at as a possibility or even an eventuality. Another thing I found inspiring is what I perceive as humanity’s slow societal decline in a world of increasing technological advancement. Our machines are constantly improving, but the quality of our lives do not overall. People are slowly being made redundant, and at some point the only thing we may have of value to rent or sell is our own minds, bodies, and souls. And if it’s a scoop you’re looking for… Husk was recently optioned by Warp Films (an award-winning film production company from the UK) for an international returnable TV series, which I’m very excited about! They loved the whole Husk universe and see lots of potential to expand along multiple storylines in a TV show format. I can’t wait to see where they take it. Did you do any specific research for the book? Transhumanism is a key theme in the book, and I looked at ideas of transcendence via technology from many different angles. I did a lot of research on the emerging drone technologies. We’re just starting to see drones come into play now, but I think they will be commonplace soon and deployed in widespread police and military applications. I also studied societal, economic, and tech projections for the next 10-20 years, so I could get a good sense of where we might end up in the near future. Some of the data was quite frightening to be honest, but very helpful for building the world of Husk. Have you always wanted to be a writer? Will you tell us a little about yourself and your background? I love telling stories, always have. When I was a kid you couldn’t get me to shut up. If you asked me about a subject I would tell you everything I knew, and when I ran out of knowledge and would outright make stuff up just to keep a story going. I never saw myself as an author, per se, but the storyteller part of me could never be quieted. As I got older, it became evident that there was really only one path for me to walk. It always felt like writing found me, not the other way. But really, I think being a good writer is simply being a good storyteller and putting it to paper. I didn’t study creative writing at school, didn’t take classes or go to University for it. I went out and lived life and had myself plenty of experiences I could draw on later in my fiction. I read an average amount I guess, but I was very careful and selective about which books I chose to spend my hours and days with. I’m a painfully slow reader, taking time to savor and digest the material. I make a point of trying to limit myself to reading only the great stuff, masterful authors and strong stories. I can’t get through a weak book, and bad writing won’t hold my attention for more than a page or two. What’s one of the first things you can remember writing? When I was in grade school I wrote this story called ‘The Bleeder’ about a giant talking beetle that would engage troubled souls and attempt to drain tainted blood out of those who were succumbing to evil. It was pretty dark for a kid, but funnily enough I received a lot of encouragement from a priest who taught at the school. He was a fan of thriller and horror novels, and saw potential in me and my stories. Why do you think people are fascinated with violent crime, and serial killers in particular? I think the fascination is prevalent because violent crime and serial killers are both horrible realities in our world, the closest things we get to the imagined horrors and unnatural monsters of our fiction. We might not be realistically scared of vampires or zombies because we know they don’t exist, but psychopaths and their behaviors are our nightmares in the flesh. Nightmares that could be all too close when you think about it. I’m naturally frightened of predators. 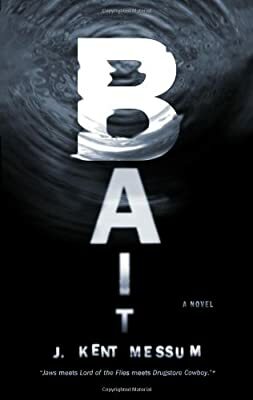 In my first novel, BAIT, the characters were forced to swim through shark-infested waters, something that would make almost anyone uncomfortable. Sharks are one of the last creatures we are genuinely and collectively scared of. It’s that fear of becoming prey that we all share deep down, that animal side of ourselves that doesn’t want to succumb to something higher on the food chain. Serial killers are predators, and they’re the most terrifying ones we have in human society. Not only do they kill, but they hunt too, repeatedly and ritualistically, and they won’t usually stop until they’re arrested. What makes them truly frightening is that they’re still human. They could be anyone, and they have no qualms about involving you in their violent crimes if you fit their profile. You’re a pro at writing the scaries, but what’s something that truly terrifies you? These days I find myself increasingly fearing the future. There are so many things that will culminate in the years to come (Overpopulation, ecological destruction, climate change, the widening wealth gap) and it will change the face of the planet and the lives of its people. Much of it looks bleak if things continue the way they’re going, and I’m scared of what kind of reckoning we may have invited with our prior mistakes. I think everyone could potentially be in for a rude awakening in the next decade or two, particularly in the West. Husk focuses on this possible future where 99% of us suffers the indignity of living, riddled with the fear and anxiety that comes with a destabilized day-to-day existence. And I’ll let you in on a little secret… I’m also absolutely terrified of being lost in a forest at night! That happened once on a hike and I was convinced something was following me, something that would drag me off into the dark. I was quick to panic and started yelling for help until my wife calmed me down and eventually led me back to our car. Now I make sure I have plenty of daylight left when I go off for a walk in the woods. What are a few of your favorite books or authors? Have you read anything lately that you’d recommend? I tend to read a lot of older books, not in the classical sense, but well-crafted and brilliant novels from 10-30 years ago, back when a much bigger premium was put on talent and originality. In our current climate of entertainment, much of the arts have focused on the quick and easy sell, pandering to lowest common denominators in order to rake in the numbers. The result is a lot of the offerings are shallow as hell and poorly made, even though they’re sold with a lot of flash and hype, which is why we have so many top-grossing turkeys when it comes to books, movies, and music. I don’t find that stuff inspiring. In fact, I find it quite depressing. I like stuff that sets the bar high, made with real care and masterful skill. I have a short list of authors I consider my favorites: Cormac McCarthy, Thom Jones, Raymond Carver, Denis Jonson, Denis Lehane, and Chuck Palahniuk. I can heartily recommend anything written by any of one of those guys. If you could experience one book again for the first time, which one would it be? It used think it was City Of Thieves by David Benioff (One of the best novels I’d read in years at the time), but nowadays I would have to choose Blood Meridian by Cormac McCarthy. That book was transformative for me, opening my eyes to a whole new wealth of literature and depths I never knew could be plumbed. I read it in my first year of University and it completely changed my reading habits. The shock, awe, horror, and impressiveness I felt upon first reading that book is something I’d like to experience again. I certainly haven’t experienced anything as potent since. What’s next for you? Is there anything else you’d like to share? I’m currently hard at work on a third and fourth novel. Both are stand-alone thrillers, although they are quite different from each other. The first is more of an old-school ghost story, about a lonely boy who moves to a rural town and is befriended by an entity that haunts a weeping willow tree in his schoolyard. The other is about a new kind of addiction that is introduced to California and soon begins to spread uncontrollably over the rest of the United States. I have no shortage of ideas for novels, in fact I’d say I have almost a half dozen books bouncing around inside my head right now. My ideas are all over the map, although they stay within the realm of the ‘thriller’ genre. I draw from anything that inspires me (horror, science fiction, historical, non-fiction) and I’ve no desire to be pigeon-holed as an author. Keeping a busy schedule is also important for me, as I get bored if I’m not working on stuff. I’m quite fond of public appearances too, sitting on discussion panels or talking to an audience about anything related to writing and books. Also, if there is one thing I can’t stress enough it’s to support the authors you believe in. Sadly, authors only get to keep creating and sharing stories when the work they produce is profitable for the companies that publish them, something I’ve learned since my first novel was published. This doesn’t just go for me; it goes for every person who is trying to make a living from writing books. The publishing industry is a fickle and cutthroat business nowadays, and it takes a lot to stay in the game. Husk, interview, j kent messum.